Ziki Questi's Blog: Are there strangers among us? "The idea is to have kind of a subtle aura of paranoia," says FreeWee Ling, with feigned innocence, of her build on LEA29, Are there strangers among us? It's part of the "Interim" project that runs through January on many of the Linden Endowment for the Arts sims (which otherwise would be vacant), giving FreeWee and others only a month to develop and exhibit something. The build, which has been evolving rapidly and may not really by "finished" by the end of the month, reminds us that art doesn't need to be without humor—there's quite a lot of it in this playful construction. Outside this central area, a roadway wraps in a square around the circumference of the sim. Jump down a manhole in the roadway on the northwest or southeast corner of the sim to race along the underground (bring a friend! ), or, on the southwest corner of the roadway, rez a sportscar and take a drive in the country (good luck—you won't be able to steer). And be sure not to miss the Fall Angels Hardhat Area. 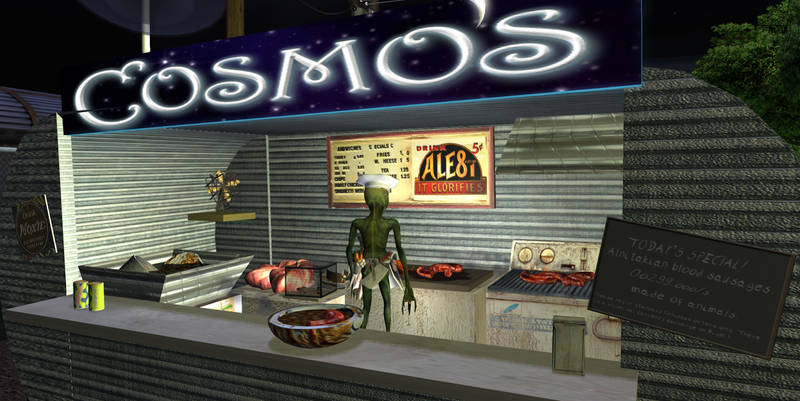 You might encounter a few suspicious characters during your visit, including the little alien bot chef (PrimCutter Nootan) at the café on the western edge.